In the heart of the Iron Triangle residents of all ages came to experience the Yellow Brick Road’s “Living Preview,” a life-sized, temporary installation that showed proposed changes around the city park, Elm Playlot. The Yellow Brick Road, a concept started by a group of teenagers six years ago, aims to create safe and walkable routes to key destinations. When complete, the routes will extend to surrounding streets from Lincoln Avenue to the Richmond Greenway Trail. 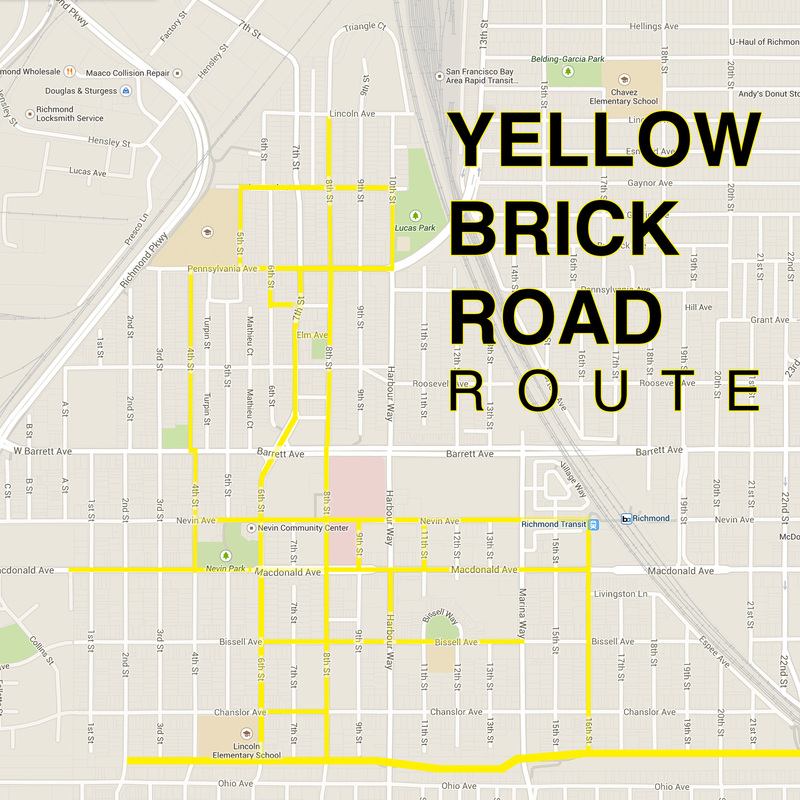 Chucks of yellow bricks will be installed along the route. “When they see the yellow brick road, families and kids know that that’s the safest passage for them,” Daniela Guadalupe, one of the pioneers of the project, said. Yellow Brick Road is named after the path followed by the character Dorothy Gale in the famous novel and movie, The Wizard of Oz. The proposed changes include adding road islands at intersections, adding crosswalks, and “road diet” or shrinking roads to get cars to slow down. Speeding has been identified as the main problem in the neighborhood. 7th St. is the “freeway through the Iron Triangle,” Pogo Park Executive Director Toody Maher said. “As people speed through a neighborhood, fewer and fewer people walk, they feel uncomfortable and unsafe, traffic safety expert Dan Burden said. Caltrans funded a $268,000 grant for planning the project. The “Living Preview” was open last Oct. 17-18. Last May, about 30 residents gathered to walk all streets in the neighborhood over a period of 21 days, Maher said. Burden walked with the residents and recommended appropriate changes that he had seen in different countries. At the end of each day, people identified barriers, potholes, and roads to fix. Then they mapped the best route, which is the usual walking path going to schools, churches and other important locations in the area. Kids helped in organizing the activity, maintaining cleanliness and giving out fliers to passing drivers and walking residents. While a lot of drivers were receptive to the informational fliers, one resident living at the corner of Elm and 7th Sts. was not. When the project happens, corners of Elm Playlot will be tow-away spaces so “fire trucks can easily come in safely,” Fire Marshal Terry Harris said. Alternative parking spaces will be provided several feet away in front of the park. “Nothing’s set in stone,” Harris said. Coleman is also concerned that the street art on Elm St. would encourage kids to vandalize houses with graffiti as well. But Guadalupe said that the kids know specific spaces where they can create their art. She also said they went door-to-door to distribute informational fliers two days before. Burden said that the neighborhood is “very unique in this country” as residents understand what they are capable of building when they work together. “If you’re looking for that little tiny speck of gold, this is that speck of gold right here,” Burden said. Posted in Field Production, News Articles, Photography, Research, Richmond Confidential, Scriptwriting, Work PortfolioBookmark the permalink.